Night-time lighting from streetlights and other sources has complex and unexpected effects on communities of plants and animals, new research shows.Previous studies have shown that artificial lighting affects a wide variety of individual species, including many moths and bats. But little has been known about how the feeding links between different species—known as food webs—are changed by artificial light. 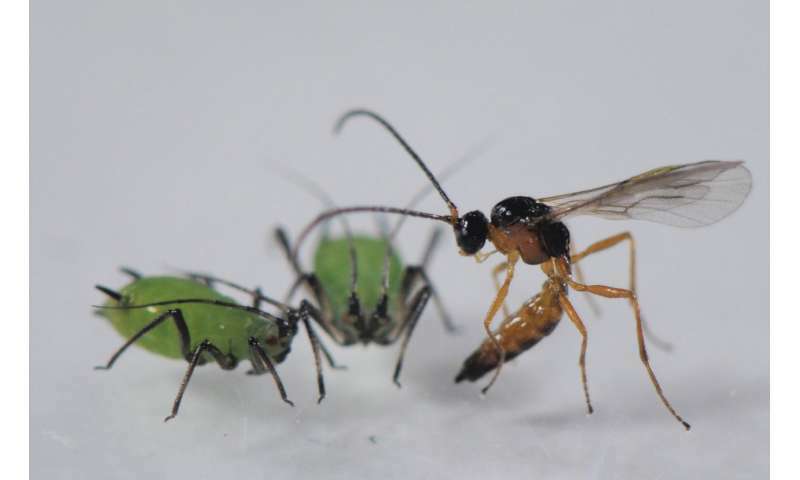 At low levels of lighting, equivalent to sky-glow from a nearby town or light further away from street lights, the parasitoid wasps had a hunting advantage that meant they killed twice as many aphids. But with brighter lighting, these wasps became distracted and flew away from the aphids.With much of the world—including 88% of Europe—now subject to some level of artificial night-time lighting, the researchers say it could be having a "widespread impact" on the way many different kinds of species interact. "We might have expected that any effect of artificial light would increase with the brightness of the light—but that isn't what happened," said Dr. Dirk Sanders, of the Environment and Sustainability Institute on the University of Exeter's Penryn Campus in Cornwall. "This shows that even low lighting—the most common level of light pollution—can have a major impact.